Robbery reports remain at five-year highs throughout Chicago’s downtown area and Lincoln Park, according to new city data. The Loop recorded 113 robberies through April 21, a 40% increase over the same time period last year. Compared to 2013, robbery cases are up 197% in the Loop. The Near North neighborhood, which includes Streeterville, the Magnificent Mile, and River North has seen a more modest 16% year-over-year increase in muggings. The five-year-trend is an ugly 184% increase. 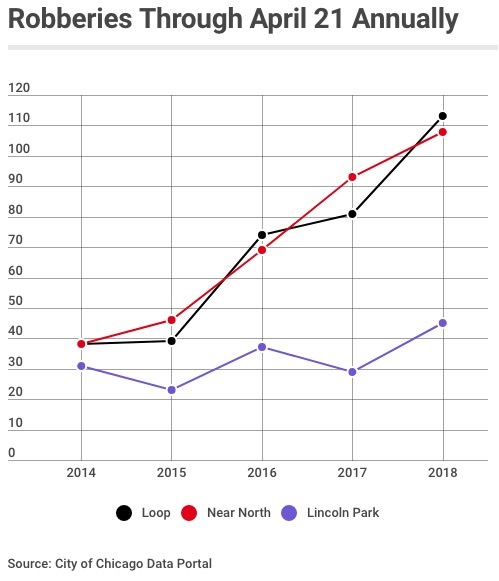 And the cushy Lincoln Park neighborhood saw a 55% increase in robberies through April 21 with the five-year trend being up 45%. • Also on Tuesday evening, the Michigan Avenue Best Buy store was robbed of cellphones by two teenagers who were armed with knives. Police said the two offenders entered the store and a manager immediately asked them to leave because it was closing time. The offenders refused, displayed a knife, and removed four or five phones from the store before running away. The robbers were described as two black males between 14- and 16-years-old. • A victim was robbed of cash in the 1400 block of North Halsted by three men armed with a handgun around 3:20 a.m. on April 16. Offenders were said to be three Hispanic men ages 20 to 25. One wore a black hoodie, one wore a red Bulls hat, and the third wore a white jacket and covered his face with a black hat, the victim said. • A woman on her way to work was assaulted and robbed by a man near the Red Line entrance at State and Lake Street. The offender struck the woman in the face, shoved her, and took her phone. Police said the victim was a black male in his late teens with dreadlocks. He stands about 6-feet tall, weighs 170 pounds, and wore a dark gray hoodie with the hood up and ripped blue jeans. He was last seen running northbound on State Street. Back CWB’s original reporting to receive members-only analysis and services year-round. Subscriptions start at $49 a year or $5 a month. You can also one-time donate an amount of your choosing. Click here — and THANK YOU!